An income statement is a must for any business. It tracks the profit or loss sustained by your company across any particular period of time. It includes money you’ve earned performing services, sales of inventory, and any expenditures made. ZipBooks will help you keep accurate, professional records of these elements so that you can get a snapshot of your business health at any point in time. When your business earns money, the whole amount doesn’t stay in your pocket. You have expenses, wages to pay, and other outlays before you can count what’s left as yours. ZipBooks will automatically track your profit and loss, using colors that just make sense, so that you can see how you’re doing, and where you could benefit from making improvements. When you use ZipBooks for invoicing, items like Sales, Accounts Receivable, and Merchant Service Fees will automatically be sorted and transferred to the correct category on your income statement. 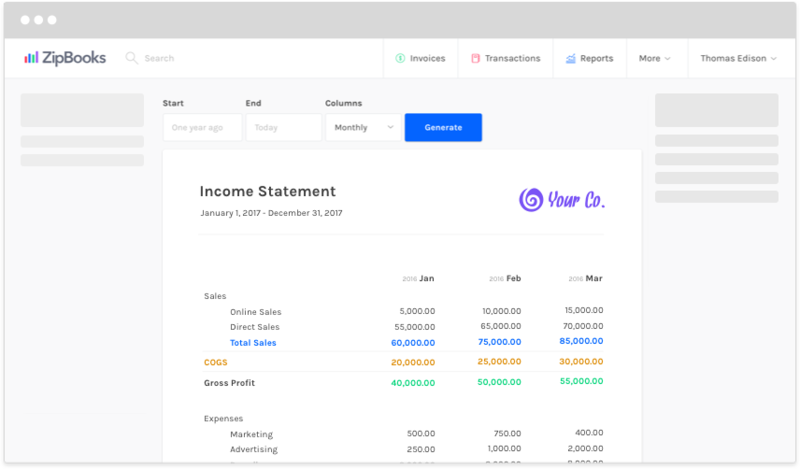 Create reports for any year or month you need to see, or generate a statement that will show you what you’ve made over the whole life of your business. Use custom categories that you’ve set up on your chart of accounts, or use the ZipBooks default accounts that are already there for you.